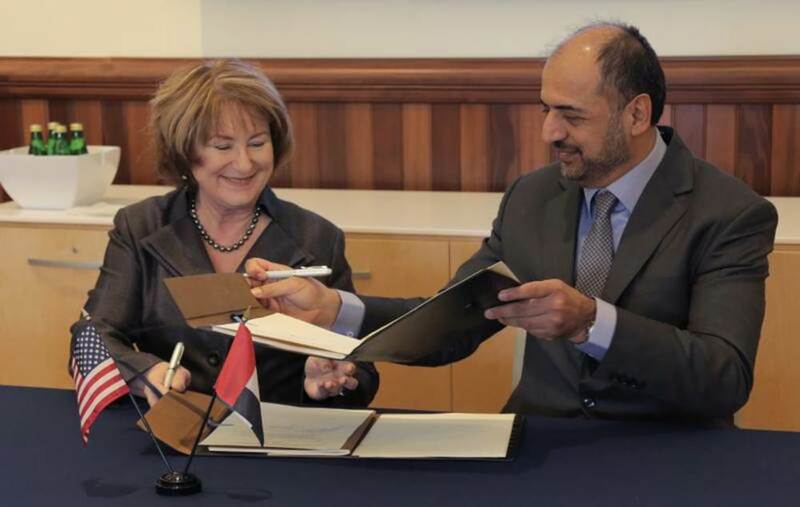 UA President Ann Weaver Hart signed an MOU with UA alumnus Dr. Abdullah Al Hashimi, divisional senior vice president of Emirates Group Security, to cooperate on a variety of initiatives including promoting the UA’s M.A. degree and certificate in International Security Studies (ISS) to its employees. The UA has a particularly strong alumni presence in the Middle East. For the past three years, the UA has sent representatives to the Middle East for the GCC alumni reunion. GCC member nations include Bahrain, Kuwait, Oman, Qatar, Saudi Arabia and the United Arab Emirates. This year, the reunion group came to Tucson, and the Office of Global Initiatives has scheduled events and lectures designed to develop and strengthen the academic, business and research bonds between the UA and its alumni. It was at the GCC reunion last year in Dubai where Jones and Paulette Kurzer, professor in the School of Government and Public Policy and director of the ISS program, began conversations with Al Hashimi and Zack Zainal, the Emirates Group Security divisional vice president. Those conversations culminated in the preparation of the MOU. The M.A. in International Security Studies, housed in the college’s School of Government and Public Policy, was launched in 2010 and currently has 140 students. Many of its 80 plus recent graduates work in the fields of border and military security; national intelligence; law enforcement; and for international organizations. Courses cover a wide variety of topics, including armed conflict, terrorism, foreign policy and the environment. The ISS program also has a strong focus on energy security, cyber threats and aviation security. The MOU states that the two groups shall “endeavor to promote collaboration in substantive areas.” In addition to offering the ISS program to Emirates Group Security employees, the collaboration might also include developing training materials (e.g., curricula, conferences) in both aviation-specific and general security topics, cooperating on research, and developing evaluation mechanisms. Importantly, the MOU covers cooperation between any UA entity and Emirates Group Security, so other collaborations can be built in the future. UA President Hart signed a Memorandum of Understanding with Dr. Abdullah Al Hashimi director of Emirates Group Security. Photo by Anna Aleksandra Augustowska.